Se ett perspektiv på Segovias natur som de flesta besökare saknar på denna exklusiva luftballongtur. Guiderad av en expert ballongvakt tar du dig till skidorna i tid för att se solen stiga och njuta av gott om tid i luften. Eftersom turnén har en maximal gruppstorlek på 10, är ​​du garanterad ett personligt sätt att utforska. Vid landning, skål upp erfarenheten med Champagne, få ett certifikat och njut av frukost. Was really looking forward to the balloon flight and it didn't disappoint! What a great adventure. Pilot Jose was very good, explained everything in both Spanish and English, a very nice man. We arrived at the field to watch the balloon being prepared and inflated which was most enlightening. The flight was great, amazing views over Segovia and nearby countryside, a perfect morning weather wise. We had a smooth landing in a field, the drove to a little park where we had a Cava toast and some cold meats and cheeses which was very nice. Given a cute little certificate and when we arrived home, had an email with a link to several photos and a video, which was great. Would highly recommend this company, great flight. Only negative was that there was only 2 guys doing the hard work of getting the balloon in and out of its bag, and getting the basket on and off the trailer, relying on the passengers to chip in and help. It was lucky there were a couple of strong young lads as passengers, I had a bit of a go but not up to that hard work anymore. Don't know if this is how they normally operate, but if they had a load of only older people aboard, would be a long time spent out in the fields while the 2 packed away? This was truly an amazing experience. The booking process was easy, we were apparently the first people to book through Viator, so the company was extra attentive to make sure all of the information was conveyed our way. Our Pilot was great and one of the few people that spoke English, it was very nice that he took the time to come over and talk to us whenever possible. We arrived early to watch the balloon getting inflated and even got to step inside for some great photo ops. The flight was simply breathtaking, Segovia is a beautiful town and seeing it form that vantage point was amazing. We ended up above the clouds for a view you could only dream of. They put together a fun collection of photos and a video for everyone on the trip as well as a certificate to commemorate your flight. We were also taken out for some nice breakfast and a cava toast. This is a must do in Segovia! worth every penny and I can't recommend this company enough. 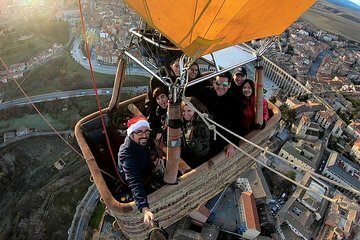 Spectacular flight over Segovia, Balloons Boreal Daniel Tarno thanks for sharing your years of experience and gave us enjoyable balloon flight. Boreal balloons, also offers take you from Madrid, with time after the flight and breakfast for visiting Segovia. A beautiful trip's video which is included in the price.